Prosperity Software Solutions is dedicated to providing solutions to meet the needs of today’s financial professional. From suitability, to concepts, we cover it all. Prosperity Software Solutions harnesses the power of the computer to bring you the latest in Point-of-Sale presentations, calculators, charts, and emotions! Using our software, effortlessly guide your clients from concept to concept, showing them where you can help them meet their financial goals. 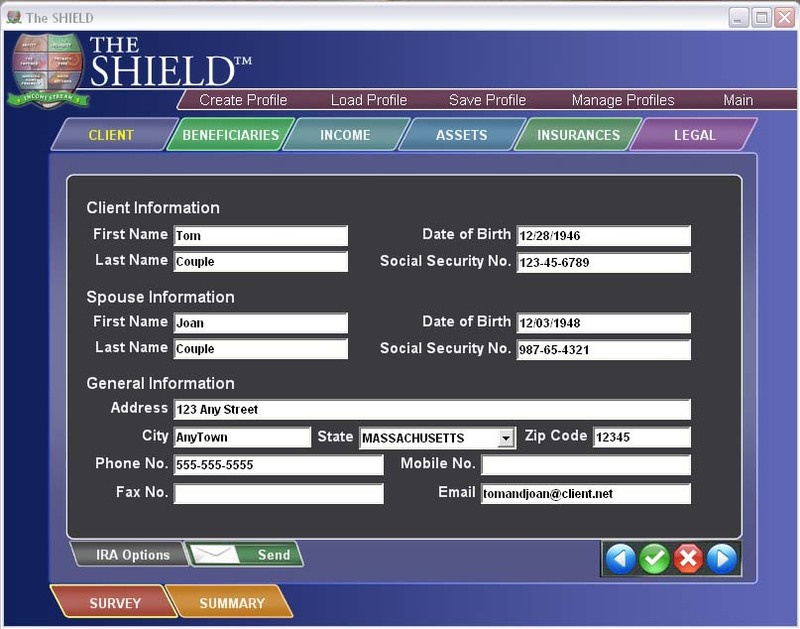 The Shield™ offers vibrant user interfaces to provide a simple and effective way to interest your clients, while maintaining a professional appearance. 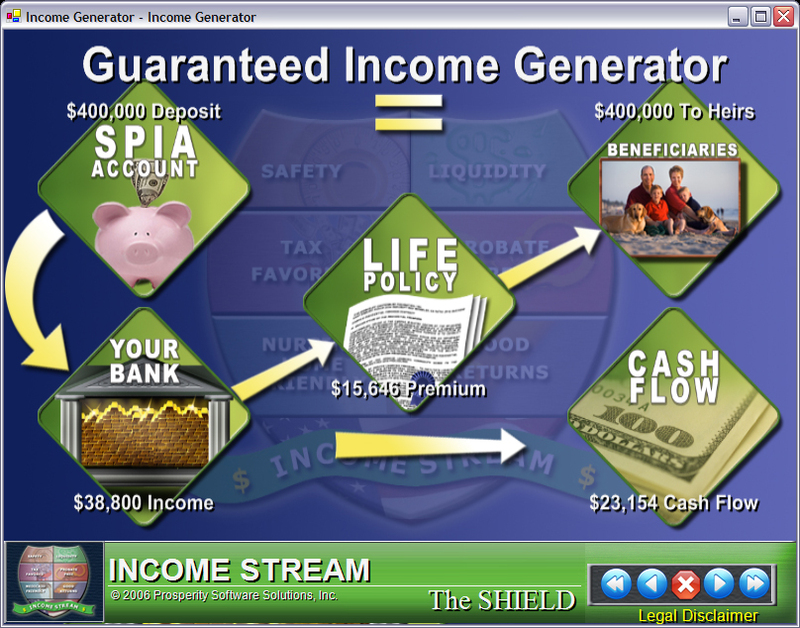 The Shield™ is easy to use and inviting to clients! Let us help you transform your business! Our presentation software comes equipped with a powerful, encrypted database tailor made for storing your client’s financial information. 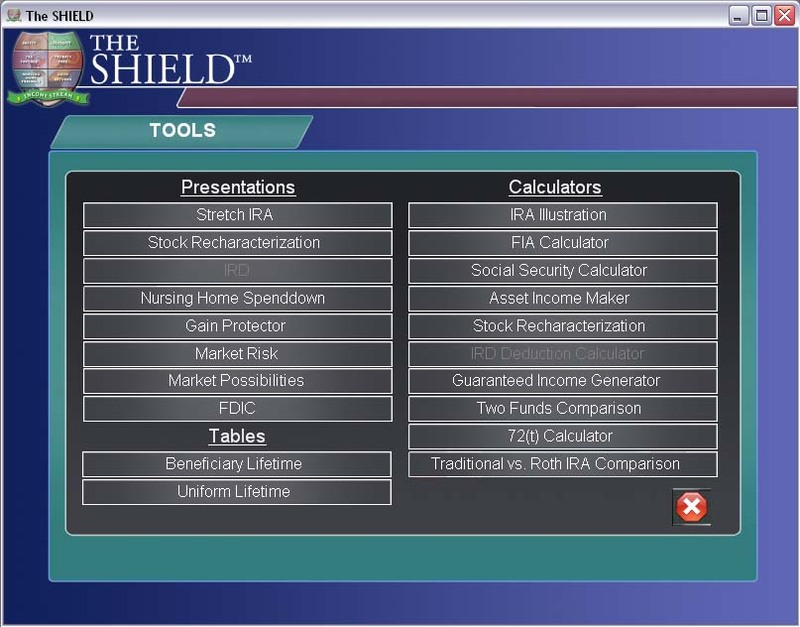 Using this customized data, you can quickly generate tailor-made presentations based on your clients financial workup. The end result? Your clients are able to easily see and understand the financial situation in front of them. Don’t just tell them…SHOW them! The printed word verifies the spoken word and our state of the art report generator creates reliable, detailed reports, customized to your clients’ current situation, with the touch of a button. Using both the summary and the detailed reports gives you the power to demonstrate for your clients the benefits of your solutions. Let the paper do the talking! Tired of lifeless presentations? Our presentation generator is the heart of our software, and will become the cornerstone of your success. Using actual information from your client’s profile, our dynamic presentation visually illustrates both the pitfalls your client is facing and the potential solutions. Finally… they WILL understand! Having the right tool for the job makes all the difference. Our convenient toolbox gives you quick and easy access to a multitude of financial calculators. 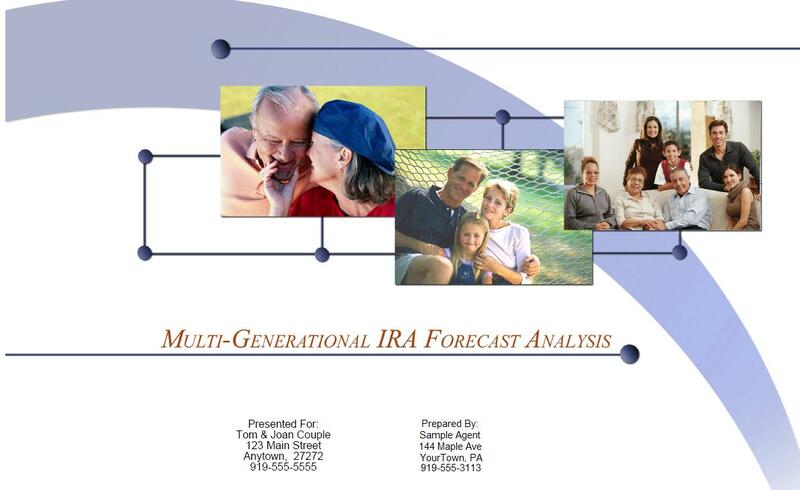 Whether you need to illustrate a Fixed Index Annuity, compare multiple funds, run a social security analysis, stretch an IRA, or do a Roth conversion, we have the right tool for you. Don’t just tell them…SHOW them! Never get lost again! Follow our step-by-step presentation wizard, or build your own custom presentation; the choice is up to you. At any time, you can jump to different sections at the click of a button. You can show them one concept, or walk them through everything, the power is in your hands. Demonstrate their needs instantly! Computers never fail…right? Backing up your data is a critical task that is often ignored. Our software does it for you automatically. If you so choose, our software automatically backs up your data to our secure, redundant servers for retrieval in an emergency. Changing computers? Upgrading? No problem. You can restore your client’s data quickly and easily with no additional software or thought on your part.